If you love reading books but do not have the time to go to a bookstore to purchase one let alone read through one, you can purchase audiobooks from iTunes for your listening pleasure. You can transfer audiobooks from iTunes to iPhone, your computer or you can also share the audiobooks with other iOS devices and use iTunes to easily transfer the files. It is possible to share with your friends using an easy to use data transfer app that can easily transfer audiobooks to their devices. In this article, we show you how you can transfer audiobooks from iTunes to iPhone and much more using a data transfer app that you can easily use on your devices. iMyFone TunesMate is a third-party iTunes alternative that you can use to transfer music, videos, audiobooks, podcast and other files between your iPhone, iPad or iPod and your Windows or Mac computers. 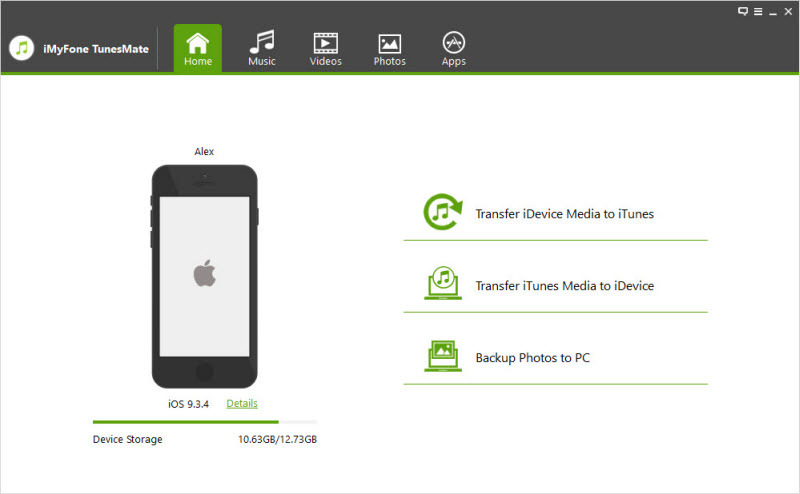 TunesMate has a two-way transfer feature that allows you to transfer files to/from iPhone and transfer to/from iTunes. Easily ransfer files from external hard drives, iTunes library, other iOS devices, your computer etc. With just 1 click you can transfer music, videos, playlists, ringtones, photos, movies, audiobooks, podcast, TV shows and much more. You can use the software to share music with your friend and even easier access your friend’s iPhone music. If your iPhone is synced with another iTunes, you can still use this software to transfer files to iPhone without deleting the old files. Launch TunesMate on your computer and use a USB cable to connect your iOS device. 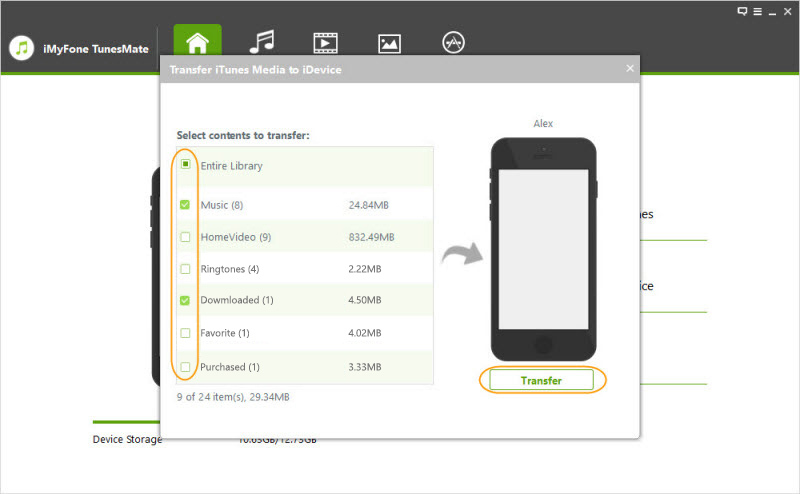 Go to the Home interface of TunesMate and click on Transfer iTunes media to iDevice. Your entire iTunes media files in your library will be scanned and displayed in a list. TunesMate will check all your media types by default. You can uncheck the ones you do not want to transfer to your device then click on Transfer to begin the transfer process. Then click on the OK button to finish the process. iTunes is an Apple’s app that helps you to manage or store your iOS device’s media data that can erase your original data on iDevice if you use the sync function. Once you have purchased and downloaded the audiobooks from iTunes it becomes easy to transfer audiobooks from iTunes to iPhone using iTunes. Install the latest iTunes version in your computer and use a USB cable to connect your iPhone to your PC. From the iTunes window, choose iPhone then click on the Audiobooks tab. Click on the Sync audiobooks button then select the audiobooks you have downloaded. Click on the Apply tab at the bottom right of the page to start the audiobook transfer process. You cannot select the files you want to transfer; you can only sync all the files at once. There is a limitation to the kind of audio and video format you can transfer. During the syncing process, you may lose files if the files in your iPhone have not been purchased from iTunes. 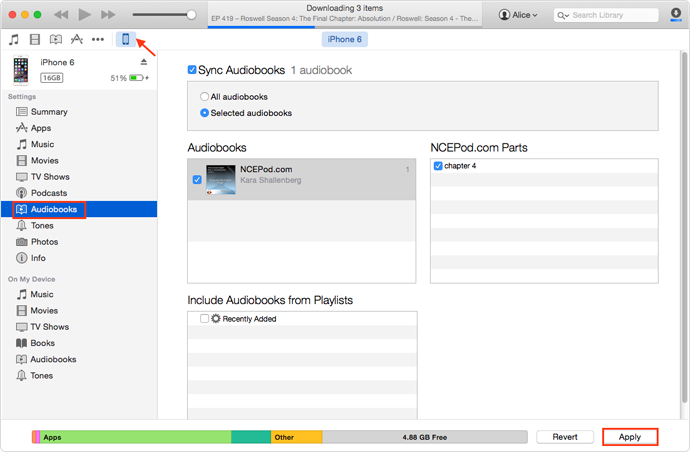 It is only possible to sync audiobooks from one iTunes library to your iPhone or your iPhone is erased. In conclusion, Audiobooks have now made it easier for iOS device users to enjoy their books without the need to reading. You can listen to the audiobooks anywhere without people knowing what you are listening to. It is also very easy to transfer audiobooks from iTunes to iPhone using data transfer software that are also easy to use. However, it is important to note the pros and cons before using any program to transfer your media data. How to Copy Books from iPad to Computer?